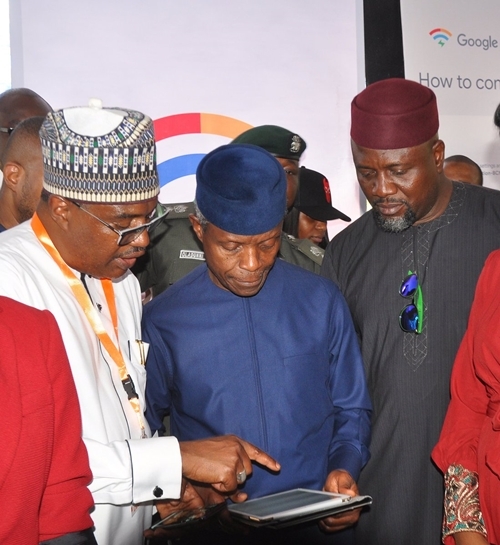 While speaking on Thursday when he launched the Google Free public Wi-Fi service in Wuse market, Abuja, the Vice President, Yemi Osinbajo, said that the launch was in line with the Buhari administration’s commitment to leverage on the gains that a data-driven digital economy offers, providing more Internet access and opportunities for Nigerians to improve their businesses. According to Vanguard, the VP stated that the event was a fulfillment of a promise made by the administration to democratise access to all Nigerians, despite social class or status. He said, “this is a very exciting event for me. A couple of months ago, we were at the Google Headquarters at the Silicon Valley. And we were told about the Google Station Free Wi-Fi in Railway stations in India. 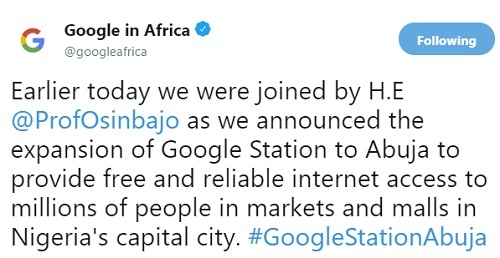 "The CEO of Google was talking about this and I said if you can put this in railway stations in India, then you must put them in markets in Nigeria. I’m sure at the time he wasn’t quite certain what markets in Nigeria would look like. But we agreed on principle and a team has been working on it since then. “It’s incredible that today we have here at the Wuse market free Wi-Fi facilities in fulfillment of that promise that was made some months ago. One of the key reasons why it is important for us to do this is because of our own policy as a government to ensure that we democratize access in various ways so that the man in the street, the common man, can have access to the things that other people have. That informs our putting solar power in markets. “We were in Sabon Gari market the other day, where we have shops that are now powered by solar power and also by bio-fuels. We decided that we’ll power the markets, Sabon Gari is one, Ariaria Market is another. As a matter of fact, Ariaria has solar and a formal plant right there. We also have one in Lagos, (gas-fired) at the Sura Market and several other markets. Prof. Osinbajo said the administration was looking at expanding the scope so that more Nigerians can benefit from access to the Internet.